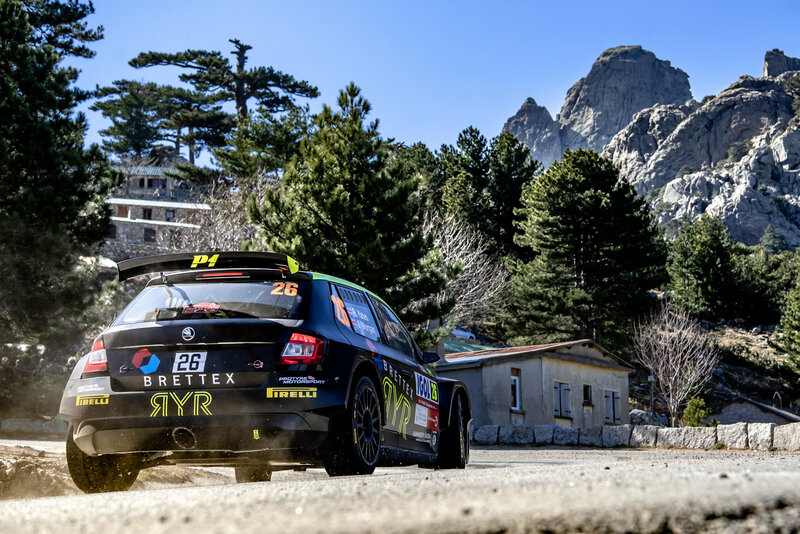 Chesterfield rally driver Rhys Yates proved his pace in the World Rally Championship this season has been no fluke, by securing an impressive fifth overall in the WRC2 category at a challenging Tour de Corse (28-31 March). Driving his Brettex Skoda Fabia R5, Yates and co-driver James Morgan battled against some of the quickest young drivers in the feeder series to the WRC, setting a string of inspiring stage times on their way to yet another top result. Added to a career-best fourth at Rallye Monte Carlo and tenth at Rally Sweden, Yates is sixth in the WRC2 championship and just five points away from second spot. The 26-year-old would head to the Mediterranean island for the very first time and would have yet another challenge to overcome on his debut WRC campaign. Steeped in history, the Corsican roads are famed for their super-fast asphalt roads with a ragged rock face on one side and a sheer drop into the sea on the other. Over 345 kilometres of competitive driving was in store over three days with long, arduous stages making tyre choice and conservation critical, highlighting its place as one of the hardest on the WRC calendar. Day one would offer one of the toughest starts to a rally with six special stages and over 121 kilometres during the day. Although not the longest of the event, no service was permitted during the tests aside from a remote tyre zone, so it would be essential to make it to the end of the leg without any issues. Yates would need to bed his way into the unique roads and tenth quickest on the opening test was a positive start. However, there was more to come and his day was littered with impressive stage times ensuring he would climb to eighth overall at the end of the day. It would be always tough to beat the French Tarmac drivers at home, but Yates kept his cool over the longest leg of the event which housed 175 kilometres on day two. The whopping 47-kilometre Castagniccia test would be the longest Yates had driven in his career, enduring flat out driving for a staggering 32 minutes. He set a time good enough for eighth on that test and by the end of the day, he climbed to sixth spot with just two stages remaining on Sunday. A clean run through the two tests including the televised Power Stage saw Yates grab fifth and a haul of valuable points for his WRC2 campaign. “I thought Rallye Monte Carlo was a difficult event but this has just taken it to another level,” said Yates. He was delighted with his pace during the weekend and believes that the event will help him as the season progresses. “I’m so very pleased with the result to be honest. If you said we would have been fifth last week I would have taken that there and then. There are some very experienced asphalt drivers here so to have come to the rally for the first time and take a result like that is very pleasing. Yates will now contest the first event in the UK in 2019 as he makes a guest appearance at the Pirelli International Rally in Carlisle at the end of April. Yates is backed by Brettex, Pirelli Motorsport, Rainworth Skoda, Nicky Grist Motorsport, H&F Furniture, NGK Spark Plugs and P1 Racewear.